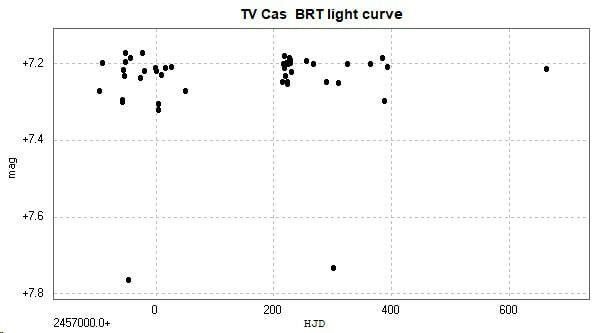 Light curve and phase diagram of the EA type eclipsing binary TV Cassiopeiae / TV Cas. These were constructed from photometry of 45 images taken with the Bradford Robotic Telescope Cluster Camera (BRT) between 2014 September 3 and 2016 October 1. The images were taken using a tri-colour green filter. 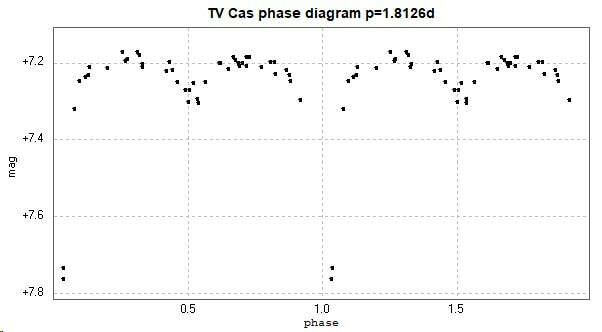 Min II is slightly later than phase 0.5 in this phase diagram, but more observations are needed to accurately determine this phase shift - assuming it is real. 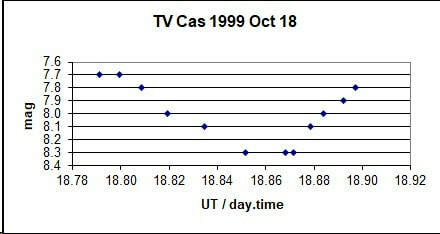 There is significant o-c activity with this star (Kreiner). From the archives - a visual observation I made from Leicester of a primary minimum using 7x50 binoculars.